Art Detectives, a partnership between the Pérez Art Museum Miami, the Miami-Dade Police Department, and two community organizations that launched last month, may be the only program of its kind in the US. MIAMI — Near the entrance to the Pérez Art Museum Miami (PAMM), Lawrence Weiner’s piece “OUT OF SIGHT” spreads across the floor like hopscotch, bold-faced text where the numbers would be: “IMAGINED THINGS CAN BE ALTERED TO SUIT,” “SPIT INTO THE WIND HOPE FOR THE BEST,” “THE DESTINATION IS STRAIGHT ON.” There’s an identical work next to it, in Spanish; Weiner frequently speaks to the demographics of the cities in which his work is showcased. 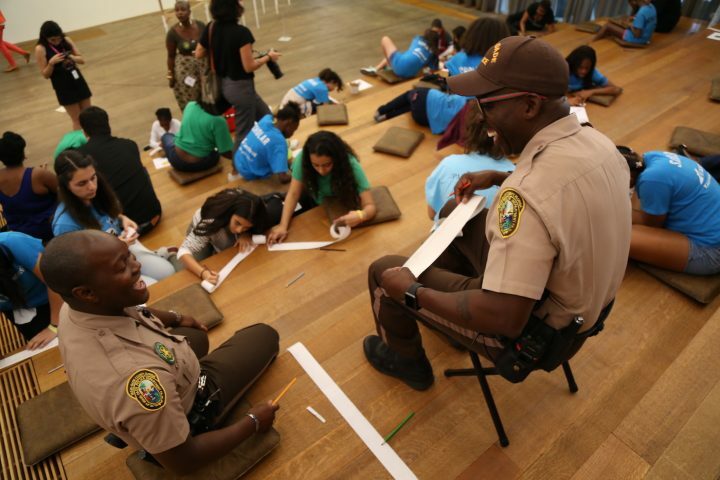 Last month, at the launch of PAMM’s new educational initiative, Art Detectives, “OUT OF SIGHT” — usually coolly examined from above, or treaded on lightly by passersby — became an indoor playground game, children and Miami-Dade County Police officers hopping across its squares. “How did things change from the space where you were — to the space you’re on now?” asked Loni Johnson, a PAMM teaching artist. One student, who’d hopped from “ASSUMING A POSITION” to “ONE CAN ONLY IMAGINE THE POWERS THAT BE,” replied: “That square represented not knowing what I had in mind yet, not knowing what I wanted. Now I have more of an idea, more of an imagination.” Reflecting on the latter square, Officer Eddy Smith related, too. “I have certain powers, given my uniform,” he admitted, “when I’m conducting traffic, or with the people I’m interacting with.” It was strange to watch the children interacting with the police (and amusing to watch the police jump from square to square), but situational gawkiness eventually gave way to acceptance of the unusual setup, and they were able to simply be together. 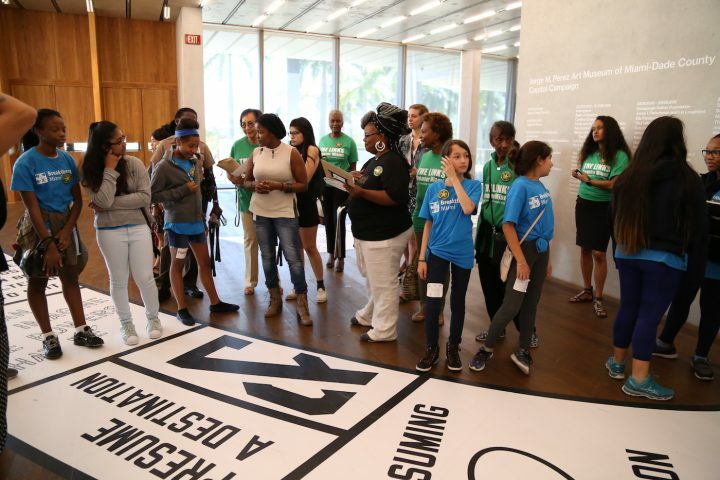 The second sessions take place in the museum, where PAMM teaching artists guide the students and police through a few exhibitions, asking questions to prompt reflection and encourage sharing. The third and final sessions take place back in the classroom, where both groups discuss what they’ve learned and, more importantly, how they feel. As an arts demographic, teenagers often play second fiddle to younger children, too old to qualify for free entry to museums or to partake in “kid-friendly” workshops. In response to this oversight, there’s recently been a widespread push to make art museums more engaging for adolescents. In addition to Art Detectives, programs targeted at this overlooked age group include the Failure Lab at the Museum of Contemporary Art Denver, Open Art Space at the Museum of Modern Art in New York, the Youth Insights program at the Whitney Museum, the Teen Creative Agency at the Museum of Contemporary Art Chicago, and the Wariyaa program at Minneapolis’s Mill City Museum, organized by the Minnesota Historical Society in response to the trial of three Somali-American young adults convicted of attempting to travel to Syria to join the Islamic State (some of these were recently profiled in-depth by Alina Tugend for the New York Times). 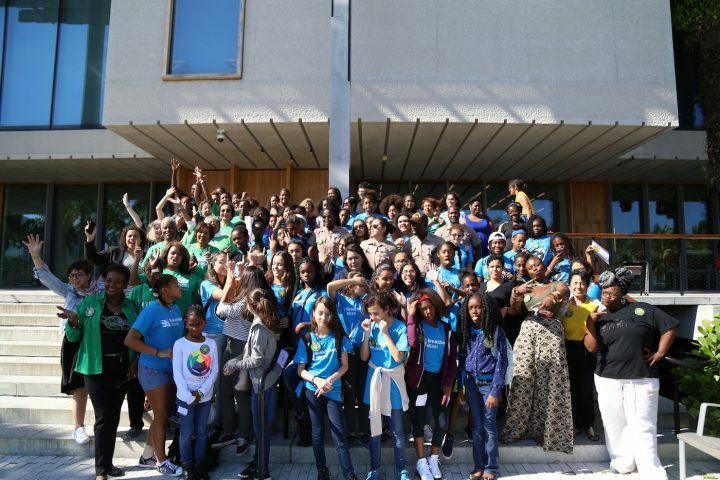 In its utilization of art to address challenging issues like inclusivity, race, and critical theory, Art Detectives is in line with other museum-based programs intent on engaging teenagers. But it seems to be one of very few art programs in the US — maybe the only one — bridging the police-community divide specifically. Miami-Dade officers have a reputation. In 2014, following a chase by Miami Beach Police officers, 18-year-old Israel “Reefa” Hernandez was killed. Hernandez had just been caught tagging a shuttered McDonald’s; an officer shot a taser at the boy’s chest. Witnesses reportedly saw the cops high-fiving and laughing at Hernandez’s fallen body, and new evidence suggests they may have chased him with guns drawn. But when the officer responsible wasn’t charged, David Ovalle at the Miami Herald posited that it was unsurprising — wholly expected, even. In 2011, during Memorial Day Weekend in South Beach, 22-year-old Raymond Herisse was killed — and four bystanders wounded — when police, in response to Herisse’s reckless driving, fired over 110 bullets at his car. He’d already stopped driving. It took four years for courts to ultimately decide no charges would be filed. Herisse was one of seven black men killed in police shootings in Miami over a span for eight months. In 2013, a new effort was launched to monitor the Miami-Dade Police Department, following an investigation by the US Justice Department, which included research on the aforementioned seven shootings and 26 others. This federal monitoring agreement was ratified last year, though the monitor is former Tampa Police Chief Jane Castor, whose officers “engaged in a notable campaign to arrest black residents disproportionately while riding bicycles.” In Miami, there are plenty of reasons to fear the police, particularly if you’re young and black or brown. The dismantling of narratives that police have internalized about community youth — and vice versa — is a nationwide, generations-long challenge. Shifts of this magnitude are slow. The significance of Art Detectives is its ability to enable the coexistence of two groups that are generally averse to each other in an unfamiliar context mostly stripped of power dynamics — and those that are inherent kept in check by virtue of the setting and the educators (here, the officers, like children, must raise their hands to speak). These kinds of small-scale efforts to open up dialogue are important precisely because, in the fight to cultivate empathy, everything begins at a small scale. At the museum, the children and police were sectioned off into three groups led by teaching artists (in addition to Johnson, there’s Chire Regans and Susan Del Conte) to examine several artworks, Weiner’s “OUT OF SIGHT” included. They were encouraged to consider why an artist might’ve chosen a particular color or composition, the larger messages of each piece, how each made them personally react or feel. The dark tones and “brick-like” shapes of Sean Scully’s “Wall of Light, Rain,” for example, inspired students to discuss home, shelter, and community; one alluded to fortitude. One police officer, seemingly inspired, did the same. None of this is necessarily problematic. But if it were required that every police officer handling cases involving youths had experience in dealing with them positively already, maybe the situation in Miami would be different. The goal here is to create a new conduit through which different members of a community can be together and hear each other. To that end, the questions posed by the PAMM teaching artists are meant to foster empathetic communication, shedding light on commonalities. We can take the purpose of this program and apply it to our community after it’s over. I hope we can create a safe space for everyone involved to continue to express themselves. This program is about being open-minded, and putting yourself in other perspectives. The purpose of this program is to learn to have compassion for all members of the community. Love equals art; art equals love. For these encounters to keep happening, maybe art can continue to serve as a common experience that facilitates conversations between members of a community who are too often, brutally, at odds. 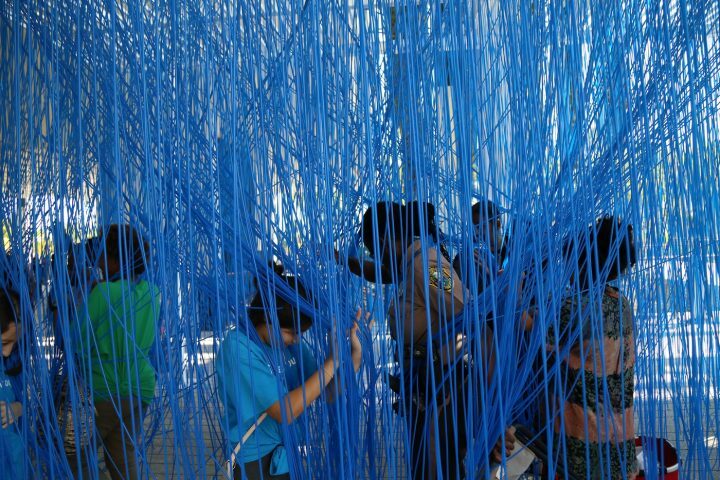 As the participation of PAMM and its teaching artists proves key, perhaps museums in other cities with similarly polarized relations between citizens and police can adapt this model, emphasizing mutual understanding and the power of listening. It’s easy to be skeptical of this kind of progress, but it’s harder still to do the work.